In addition to the number of genealogy research resources the State of Michigan offers, vital records for Antrim County can be found at the Antrim County Clerk in Belleaire, MI. The Clerk offers birth and marriage records, both available from 1868 to the present, death records, available from 1867 to the present, and others, such as divorce records. All copies are certified and cost $10 for the first copy, with $3 for additional ones. Originally named Meegisee County, Antrim was renamed in 1843 along with many other counties in the state. Named after County Antrim in Ireland, there were a large number of Irish and Scottish immigrants settling in the area during this period. 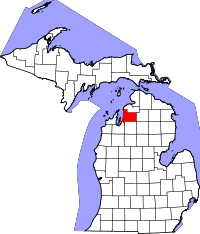 Due to the county's location bordering Lake Michigan, a large percentage of the county is comprised of water, and it has a fairly small population of only approximately 23,000 people residing there.